Driving in the winter can mean tackling snow and ice, which can be daunting if you’re not used to it. Follow our simple guidelines below to ensure a safe and trouble-free journey. The most important piece of advice to remember is that if the weather forecast gives warnings of snow or ice, you should only travel by car if the journey is absolutely necessary, and you should always take an Emergency Winter Essentials Kit in case your car breaks down. You must be able to see properly before you set off so be sure to clear all the snow and ice from your windows, mirrors and windscreen, as well as from the roof of your car – sudden braking can cause the snow on your roof to slip forward onto the windscreen and block your view of the road. Also, don’t be tempted to set off until your windows are properly demisted, and if they mist up during a journey, always pull over until it clears to maintain good visibility. Your lights and number plate must be clean, clear from snow and easily visible. Once your car is clear and ready to go, always remember that if the weather conditions worsen, your best course of action is to turn back. Never continue with a journey you feel has become unsafe. If you set out and the road has not been gritted, avoid driving in the tyre tracks of other road users. The impacted snow could have become icy, and will be more slippery than fresh snow. If snow is still falling as you travel, be sure to stop regularly to clear the snow from windows, lights and number plates. Take extra care when passing vehicles spreading grit or snow ploughs. Only overtake if the road has been properly cleared and it is safe to do so. Listen to weather and traffic updates and be ready for the conditions on the road to change very quickly. Avoid sudden movements or braking which could cause you to lose control of your vehicle. Maintain a slower than normal speed, in a higher gear. Remember that speed limits are the absolute maximum you are allowed to travel at if the conditions are normal and fine – in adverse conditions, the speed limit will be much too fast. 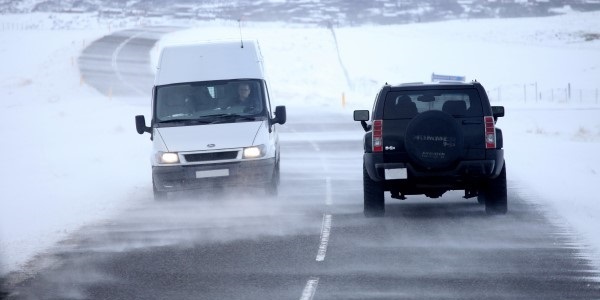 Maintain safe braking distances between you and other road users – your braking distance on icy roads can be ten times further than on dry roads and you need to have the time to react, brake and stop gently, so keep your speed down too. Take extra care and reduce your speed further on bends or corners. Brake gradually on the straight before you reach a bend – not on it. If your vehicle begins to skid, gently steer into it. So, if you find your rear wheels are sliding to the left, steer towards the left. Do not brake or take your hands off the steering wheel. If you get stuck in snow, do not rev your engine – the extra power will not force your car out of the snow, it will simply make the rut deeper and you’ll become stuck further. You should move your vehicle forwards and backwards very gently using the highest gear you can. If this does not work – be glad you packed your emergency kit and use your shovel to dig a clear path for your tyres. If your car breaks down, stay with it and call your breakdown company. If you’re looking to rent a vehicle this winter, contact the team at Caversham Vehicle Hire. With a range of vehicle types and sizes to choose from, you can be sure to find one that meets your needs and budget.